This post is the first in a series featuring the innovative projects/programs that our colleagues are implementing with the help of internal grants offered by the Emory University Libraries. The two internal grants are the Innovation Grant and the Mini-Grant. These are available to support innovation or the purchase of tools or training that will enrich existing library services, programs, and workflows. 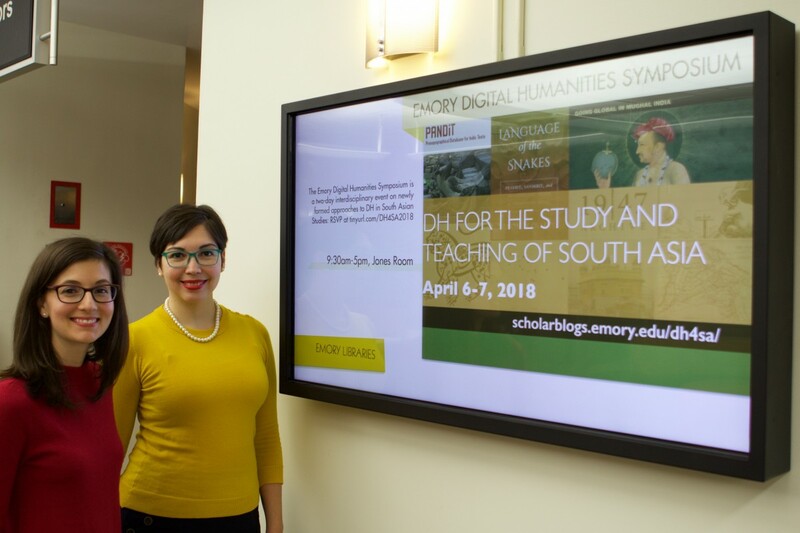 This first post is written by Ellen Ambrosone (South Asian Studies and Religion Librarian) in her role as a subject librarian planning and putting together the first international and interdisciplinary digital humanities symposium for the study and teaching of South Asia. Ellen Ambrosone (left) and Anandi Silva Knuppel (right). On April 6th and 7th, the Woodruff Library will host the Emory Digital Humanities Symposium: DH for the Study and Teaching of South Asia. This is an interdisciplinary and international symposium on newly formed approaches to digital humanities in the field of South Asian Studies. Though there have been other digital humanities conferences that focus on Asia more broadly or on one DH method for the study of South Asia, this symposium will center solely on South Asia and consider the role of DH throughout the cycle of scholarly production. The two-day symposium of panels, demos, and a roundtable discussion will replicate this cycle – one in which individuals access archives or create their own, analyze data, teach about their research, craft scholarship, and publish in some format for public consumption. As a subject librarian, an event such as this is an exciting opportunity to bring together library professionals and scholars, who often work at different points in the cycle, to talk about shared challenges and possible solutions from a variety of perspectives. For example, we might ask how problem-solving the creation of OCRed (optical character recognition) texts in South Asian languages impacts the way a scholar interested in text analysis imagines the possibilities of their future scholarship. Luckily, we have Nicole Merkel-Hilf, a librarian at the University of Heidelberg, coming to speak about how this challenge was met with texts in Devanagari script, the script most often associated with Sanskrit and Hindi, for Naval Kishore Press – Digital. She will present on the same panel with Andrew Ollett, a scholar who will talk about a variety of formats and technologies for working with texts from South Asia, who will demo his use of SARIT (Search and Retrieval of Indic Texts), and discuss publishing his first monograph with the University of California Press’ open access publishing program Luminos. From a teaching perspective, we can consider how a digital collection of personal narratives of important historical events brings new possibilities to teaching history courses such as HIST 489RW: India: Partition/Independence. We are fortunate that the founder of the 1947 Partition Archive, Guneeta Singh Bhalla, will be present to speak about her collection of the life stories of those impacted by the Partition of India and Pakistan. These are just a few examples of the ways in which collaboration between subject librarians, academic departments, and digital research centers contribute to the creation of knowledge on South Asia and to the mission of the University to create, preserve, teach, and apply knowledge in the service of humanity. A complete list of presenters and projects can be found on the event website. This event would not be possible without the support of Emory Libraries and the Emory Center for Digital Scholarship. My co-organizer, Anandi Silva Knuppel, and I received one of the library’s first Innovation Grants, which not only provided significant financial support for the event, but also allowed us to think creatively about how we could collaborate to bring something unique to the field of South Asian Studies. Being supported in this way is simply priceless. The symposium is also generously funded by the Emory Conference Center Subvention Fund; Emory Laney Graduate School New Thinkers/New Leaders Fund; Institute for Quantitative Theory and Methods; Fox Center for Humanistic Inquiry; Emory Center for Digital Scholarship; and Middle Eastern and South Asian Studies, Religion, and Sociology departments. The event is open to the public. Please RSVP at tinyurl.com/DH4SA2018 or on Facebook. For those who cannot attend, presentations will be livestreamed at: http://emory.adobeconnect.com/dh4sa2018/. For more information about the symposium, contact Ellen Ambrosone (ellen [dot] ambrosone [at] emory.edu) and Anandi Silva Knuppel (anandi [dot] silva [dot] knuppel [at] emory.edu). Learn more about the digital humanities by browsing Emory’s holdings in DiscoverE.